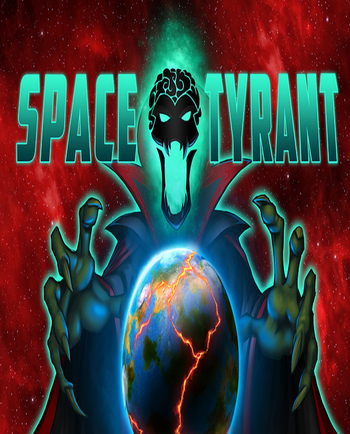 Space Tyrant is a sci-fi, 4X strategy game, released on PC by Blue Wizard studios in 2018. As the name suggests, you play as a nameless force of opression attempting to conquer the galaxy. Standing in your way is the Senate, the galaxy's legitemate government. Action Bomb: Hoplite Destroyers can be upgraded to ram into enemies and explode at 10% health (Kamikaze I and II, respectively). The Hoplites build their ships around (and sometimes mostly out of) asteroids. Techno-Slugs use seashell-shaped vessels with weapons that fire rainbow-colored bolts. The Astron Union have Raygun Gothic ships with the tesla coil looking weapons popular in early sci-fi. The Senate use ships borrowed from whoever is the local group, just with a coat of red and gold paint. And Your Reward Is Clothes: Winning a level grants you a new hat, cloak, or scepter. Anti-Frustration Features: During Capture missions, Cores will never ally with the senate. On the mission select screen, winning a mission in a territory removes all Senate control counters from it. Anti-Hero: The Senate shows signs of not being as benevolent as they appear. If they successfully unite an entire system against you, the planets' forces are entirely replaced with blatantly brainwashed soldiers who mindlessly drone on about "the Great Leader" and mindlessly throw themselves at you, even if they stand no chance, all for "the glory of the cause". Asteroid Miners: A Hoplite scheme and a Bzzerk perk both increase your credits income for owning the otherwise mostly useless asteroids. Card-Carrying Villain: You make no secret that you're the bad guy. Colony Drop: The Bzzzerk have a card that destroys a friendly ship to deal two damage to a Besieged world. Converging-Stream Weapon: The special ability of the Hoplite Dreadnought fires several beams at a point... which then fires several beams at multiple targets. Hoplites are Balanced; have middle-of-the-road ships. Neither exceptionally powerful, durable, or cheap. They have two 2X2 ships available through special cards. The Bzzzerk are Spammers, having relatively cheap, disposable 1X1 ships not even intended to last much more than a single battle. Instead of cards that add huge ships, they have the card "Saviour of the Hive," which summons a temporary level 4 fleet with a pair of huge ships. The Techno-Slugs are Powerhouse, fielding expensive ships that fire weaponized lightshows. The Astron Union is Brutalist, having Stone Wall ships. The Senate is also Spammer, while also being quite Gimmicky. The Senate tries to crowd you off the map with free fleets launched by Special Projects, and has several annoying tactics like sabotaging your Science production through Hacking and instantly capturing Neutral worlds (which of course, spawns Another Bloody free fleet). Cthulhumanoid: The Tyrant himself is of the same species as Shocktopus. Death-Activated Superpower: All factions Destroyers have some sort of Nasty Surprise(tm) that activates upon their deaths. Death Ray: Useable on the galaxy map. A psychic weapon that works by chanelling the galaxy's hate and fear towards you into a laser beam. Double Meaning: The Techno-Slugs are not a *political* party, they're a nomadic, species-wide rave, similar to The Party from Hitchhiker's Guide to the Galaxy. The Dragon: It's implied that the character you choose at the start of a mission is your leutennant. Escape Pod: Weaponized by the Bzzzerk. Their Destroyers have an upgrade that allows their crews to launch a swarm of fighters when destroyed. Fight Like a Card Player: You gain one card per turn. These can be things like adding some free ships to a fleet or attacking a world your fleets failed to capture again. No Campaign for the Wicked: Inverted. The Senate and Astron Federation have no campaigns. No Name Given: Militia admirals are never named. Macross Missile Massacre: The armaments of the Hoplite Cruiser is a brace of missile launchers. Their very first upgrade goes from three tubes to six. Hoplite Destroyers are also armed with missile racks, and have a Volley ability. The Bzzzerk Dreadnaught launches a massive volley of missiles at random targets as its ability. Orbiting Particle Shield: An upgrade for the Hoplite Battleship. However, they simply scramble targeting sensors, giving it an increased dodge chance. Planet of Hats: Each faction has their own schtick. Hoplites are a Proud Warrior Race. The Bzzzerk are Insectoid Aliens concerned with the survival of the Hive at the expense of individual bugs. Petting Zoo People: The Hoplites, a race of rabbit-like aliens. Psychic Powers: The upgrades "Misery Weave" and "Networked Targeting" (available only at random) work by feeding off the enemy crew's despair to regenerate the attacking ship and inducing a Hive Mind to increase weapon accuracy, respectively. Shout-Out: The Astron Militia cameo looks exactly like The Rocketeer. The Techno-Slug Party is a huge nomadic rave, going on since goodness knows with no signs of stopping. One battle quote is "Tonight we dine in Space Hell!" Spam Attack: All Frigates and Destroyers have the ability "Volley," which fires their main armaments once for one Energy. The Hoplite Frigate can be upgraded to "Tactical Volley," which has a chance to make an adjacent Frigate fire as well, and further with "Combined Arms'' which causes two adjacent frigates to volley. Support Power: Each admiral (including the various races' Militas) has a different activable ability that gives some manner of advantage. Also, before each battle, you choose a single-use Tactic from three randoly selected from a pool of 20 or so. Try to Fit THAT on a Business Card! : Every time you win, you gain a new title based on your actions in the game. The Unintelligible: Shocktopus comunicates only through gargling. Villain Protagonist: It's in the name. Wave Motion Gun: The armaments of the Bzzzerk Frigate and Cruiser are a single beam cannon that fires very slowly. The Cruiser version causes the entire front half to violently recoil. Zeerust: The Astron Unions ships and costumes look like they're right out of Buck Rogers. Zerg Rush: The Senate's main tactic is to squeeze you out with huge amounts of fleets conjured by the use of the Deploy Militia Special Project.